The best quote I've heard recently was whilst I visited an education technology lesson in Adlai Stevenson High School. 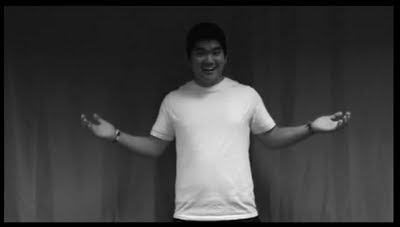 The teacher was asking students to share their project work, which was based on making a film in a specific style. One student volunteered. The teacher queried whether she had received it. The student noted that she had and followed up by saying - "anyway- just YouTube it! ", which she promptly did and then played it for the class. It's a nice little video demonstrating a range of understanding and skills. This student had not only sent his homework in, and volunteered to show it to the class - he had already shared it with the world. Students are often proud of their work - they are sharing, celebrating and promoting their own skills and talents. Broadcast technology is now something everyone can do - at any time from anywhere. No one really needs specialist equipment and people do have the skills. This explains why 20 hours of film is uploaded to YouTube every minute. There is no doubt that increasing numbers of students will want to share their work in this way - and why not? But how many teachers right now would accept work submitted this way? Not enough I suspect! Reflecting on teaching - then considering learning environments. The right way round! It's always fantastic speaking to, and working with, teachers who want to know how they can continue to improve their practice, and be really motivated to contribute to the design of their learning environment to allow their students to learn effectively now and in the future. I was speaking yesterday at a 'Design Summit' with the Science Department at the excellent Adlai E Stevenson High School, Lincolnshire, near Chicago. AESHS, with 4,500 students, is one of the most successful schools in Illinois and lots of their facilities are fabulous. The very good Science Department is the next department to have it's physical facilities put under the microscope for improvement. The very engaged and committed faculty members have really spent time beginning to consider what they want. What they do NOT want is simply new 'old' facilities. Encouragingly, they have done absolutely the right thing by looking at what they want students to be able to do, how they want students and staff to learn together and explore a wide range of pedagogical approaches. They are also going to really engage with students to ensure they have a powerful voice in learning and then consider how all this affects design. This makes life so much easier for staff, architects and facilities staff to start a good dialogue when the project starts. The Faculty have already started the conversations internally: they know they do too much whole group teaching, they want more practical work, they want to be more agile in teaching strategies and increase personalisation, and have much better integration of appropriate technology. The very dedicated staff do want to know what is happening in other places, nationally and internationally. They are really thinking before rushing into any decisions. This approach is just so right! Architects Rick Dewar and Trung Le from owP/p planned this summit and science staff worked all afternoon and well into the evening fully engaged and identifying aspects they wanted to explore further. It was a vibrant and engaging event. I was really happy to be part of the session - it just has the feeling that the students are going to continue to have massive opportunities in science to learn in ways they really motivate them! I just wish that every school approached things in this open minded way. 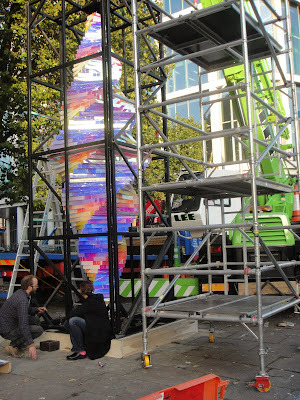 I am very excited to have been a very small part of this project and look forward to seeing the end result! In Chicago as speaker at a school design summit, it was fun to see the CBS weather report being live broadcast from the studio on a street corner last night as I walked past. With a massive outside TV screen directly above the window looking into the studio, the 'magic' of green screen technology was clearly visible. Television studios in the States have had this link with their viewers and passing public for years - but it's not so everywhere. I'm not really sure why. The transparency agenda is getting everywhere and so it should. How they make the local news and weather stories is not a secret.. The secrets of daily programme making are debunked as people can see and feel the connection within their immediate community. This also translates into schools - parents and the community really should know more about how schools work and fully understand their role in the development of opportunities for their young people. It is getting better though - this increasing transparency will really help develop that understanding - and about time. I've enjoyed working with a new piece of technology recently. (Well - new to me that is!) Working with a digital pen has proved to be really useful and saved a great deal of time in recent meetings. Many people do not like people typing notes in meetings - and unless one is very good, things do get missed. It can also be noisy and distracting. With the pen remembering what I write visually via camera and, in some meetings recording the audio, has allowed me to ensure notes are accurate. Pressing the pen to any section of writing, in any order, provides instant playback of that section of meeting. By downloading some additional software it also quickly turns even my writing into text which I drop straight into a word document. (It even works with my writing). It's clever stuff. Admittedly you have to use special paper which, fascinatingly has control commands printed on the bottom of each page, but replacement paper and refills are remarkably cheap. No more typing up notes from scratch at the end of a meeting. It is no wonder that students are quickly learning about them and buying them. Writing lecture notes and sharing them (as well as the actual lecture audio) has never been easier. The potential is very interesting. I know that graphic tablets avoid the use of paper altogether - I used one for a long time - but it was all a bit more cumbersome and not really reliable. (It also did not record audio). Pencasts join the world of pod and vod casts - you can literally hear somebody talk and the writing or diagrams appear on the screen as they go through it - really useful for complex explanations. My pen is a Pulse smart pen by Livescribe complete with a 2Gb memory. I have no idea of its full potential yet, but the first impressions are really good. The number of people who have asked to see it in just a few days has really surprised me. I'm really interested to see whether these 'take off' - right now I can't see why they wouldn't! I keep wondering when we will go too far when worrying about health and safety. When are we going to stop doing things because of the dreaded H&S worry? Already lots of staff are nervous or even avoid doing things such as trips, practicals etc because of this. (Having said that, I would, of course, never want anyone to get hurt in schools). But how far can H&S go? We have all read health and safety stories in the media where the world seems to have gone mad - there are some really barmy examples, but surely there must be a balance somewhere. 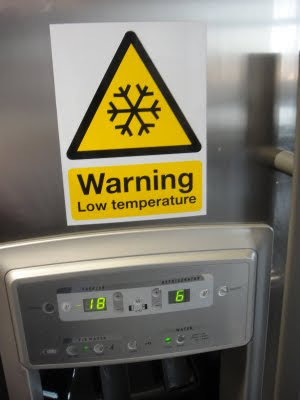 At times I work in a large number of environments full of very intelligent adults - do they really need a huge yellow safety notice on the freezer saying that it is the scene of a low temperature? It's a freezer, it has ice in it - they know it's cold! These intelligent adults learnt that inside freezers are cold some time ago, probably before infant school, before they got their GCSE's (or 'O' levels), before their first, second and for all I know third degrees! I can't help but compare it to a vocational school I visited in the Netherlands earlier this year. The technology room, although locked when empty, stored the craft knives on pegboard on the wall, without being locked away. 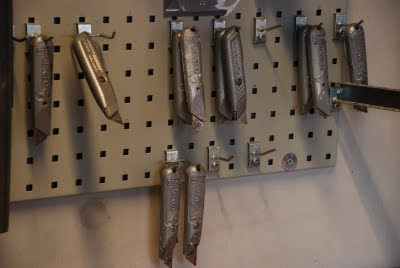 Whilst they 'counted the knives in and out' at the start and ends of lessons, they had not lost one for years. It's just a comment but the truly 'comprehensive' range of teenage students at this school realised that they were sharp and potentially dangerous without a notice telling them so. 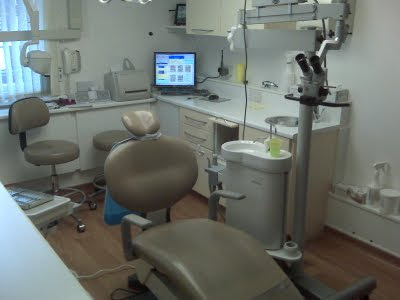 As I sat in the dentists recently, (a place I really do not like), I was reminded of comments I heard from Prof. Stephen Heppell, comparing dentists to education. 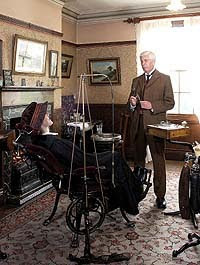 We would not dream of expecting to be treated in exactly the same way by dentists as they did decades ago - whilst basic concepts remain, skills technology and experience have moved on (and so have prices!!). Education is no different - research, skills, knowledge, expectations, aspirations have all developed and continue to do so at increasing speed. We know so much more about teaching and ways of relating to our young learners. I am, therefore, disappointed and concerned when I hear teachers saying that they just wish to carry on teaching exactly the way they were trained, in one particular case, twenty five years ago. Another teacher has noted in the past "there is nothing anyone can tell me about my teaching!" Ummm - a bold claim I fear (and not one that I could say)!. What does encourage me is that there are now so many people working to develop new skills, embrace new technologies and ensure learning is relevant, responds to the needs of learners and allows them to really use their skills in meaningful ways. It is a long journey, we have to undertake it. We accept the concepts of education, we want students to be literate, numerate and so on. However, the challenge is often to ensure that learning takes place in an integrated way with authority / school vision and developing appropriate curriculum and assessment methodology with students, staff, parents, community, businesses all part of the learning environment. We cannot go back in time. Why would we ? The world is moving too fast, expectations, technology, skills and experiences are looking forward. I certainly wouldn't want the dentists to go back in time and use old techniques - why should our students? I think back to all the wood technology classes I have visited where younger students were all making identical pen holders and the older ones bird tables...... Knowing how to use the tools is great and important for a number of students. But now, introduce a bit of technology and the results are so different. It's an interesting discussion - in the few hours allocated to technology per year, especially in Key Stage 3, do you go for skill development using basic tools - or go for something much aspirational and relevant? And did we ask the students what they wanted to do? Maybe they would have linked it to other work rather than creating stand alone objects. Vocational training for heavy machinery - several real seats complete with full controls were installed in a school engineering department I visited recently. The Phelps High School in Washington DC with an engineering focus had several control seats from caterpillar machinery linked to simulator modules, allowing students, staff and the community to train / practice on real controls. The screen provided the opportunity to allow operators to see what they were doing. Clearly there was considerable interest amongst students, but it also provides relevant vocational training (and updating) for adults in the community. How sensible - adults and students sharing resources - it is obvious isn't it! This is a fab resource - not one I've seen in the UK - yet. I'm sure it will not be long however in our engineering schools, if we really liaise with our industry partners..... and if we're smart! If there is a schools with simulators for vocational training - do send a picture and let me know! I am happy to be proved wrong. Lots of schools now encourage students to have a bottle of water with them. I know several schools that encourage students to have water with them at all times to ensure that they are properly hydrated. But where do you put the bottles? They can get in the way on the desk especially if students are working with a variety of resources. 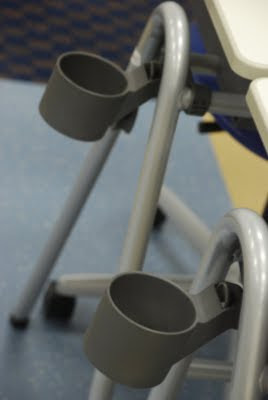 I recently saw these great desks from VS Furniture with a bottle holder incorporated into the design. Simple - yes, obvious - yes, but I haven't seen any others that include this feature. Just a really good idea really. 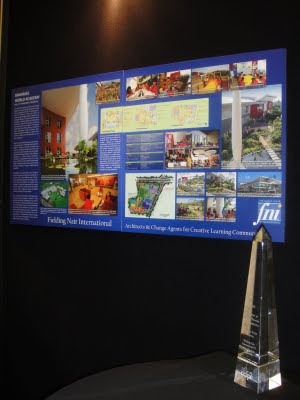 During the cefpi conference I was really delighted to see that colleagues and friends at Fielding Nair International won an award for their new school design in Indonesia. They also entered fantastic designs for schools in Australia and America which won considerable praise and comment. The designs reflect agility and the careful imaginative use of space that they are known for all over the world. Their entries did, I'm afraid to say, leave some of the other entrants so far behind it was unbelievable. This is not just my view - a large group of us were tasked during one seminar to rank the whole design exhibition in terms of designs features to encourage learning rather than to simply fulfill organisational conveniences. We did this prior to the exhibition judging was announced so did not know the result. In our six informal seminar groups, three awarded the FNI Indonesia Project top grades, whilst two other groups chose the FNI Australia project. Only one group chose another design from the many other entries. I think that says something really! For more on FNI's innovative work, check out their website. Click here.